Now in its 3rd edition, For Instruction in Righteousness has been updated and expanded after 18 years of faithful service. This new edition has over 50 pages added, with many chapters expanded as a result of additional parenting experience and Bible study. What the Bible likens a person to when he indulges in this sin, and ideas for practical object lessons using these examples. How God blesses the person who resists temptations to this sort of sin, with parallel ideas for “rewards” and encouragement when children show progress in overcoming this sin. We want our children to understand that “right” and “wrong” are absolutes, based on God’s standards, not ours. If we train our children to submit to the authority of God’s standards, those standards will not change when the children grow up and leave the authority of our homes. We don’t want to discipline in anger; we want to show grief over the child’s sin, and we want to lead him to true repentance. When we discipline, we want to picture for our children our heavenly Father’s holiness and His mercy. That is why we went to the Bible and started studying. 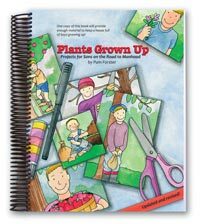 This book provides a wealth of material for personal Bible study, family worship, character training, unit studies, and Bible study projects for older children. Scripture quotations are from the KJV and NKJV. Recommended by the Association of Certified Biblical Counselors. This blog review compares the new and old editions of For Instruction in Righteousness. With our new eBook options, you can have everything that is in the print edition of FIIR at your fingertips -- on your phone, tablet, or other mobile device, and on your laptop or home computer where you can print out pages for your own family's use! The EPUB edition works best for reading on iPads, iPhones, and most eBook readers. It works well, even on small screens, but is not easy to print pages or read on a computer. The PDF edition is best for reading on your computer, printing pages, and reading on most tablets. Both editions have a linked table of contents, links to Scripture texts, and the ability to search the book for certain words or topics. Learn more about Doorposts' eBooks. Since using this with our children (now young adults), we have recommended this as an ESSENTIAL parenting tool to everyone we know. We used this topically as needs invariably arose and also as a supplement to Bible study. Matching behavior to Biblical consequences and blessings brought TRUTH to life and applied it in a way that even the youngest toddler could understand. Our "kids" still remember the object lessons and hands-on activities that helped us all hide God's Word in our hearts and minds. I have never found a better resource to encourage being DOers of the Word and not merely hearers! Thank you, Thank you. WOW. Talk about a blessing to have at one's fingertips! We have been using this for our small children and it has been great to have such a complete reference guide that is all straight from God's Word. It has been just very helpful and I would recommend it 100% to any family looking for a worthwhile investment in raising children in the ways of the Lord! This is a reference that both Kids & parents love! Recently, after my son did something requiring correction, he said (longingly), "Are you going to get your book out, Mama?" The children WANT me to use this book in their correction! That's a testimony! 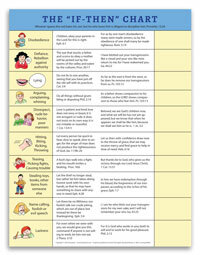 This tool is so helpful for what to talk to your child about when you send them to your room! I would grab the book and get some insight and scripture to deal with the heart. Thank you so much for this resource!! Best Parenting Tool for Training Your Children! Why can I say that? It's the Bible! Totally Bible based training. Not to beat up your children with Scriptures, but to train them before trouble presents itself and correction after. My children range from 33-11 years old. 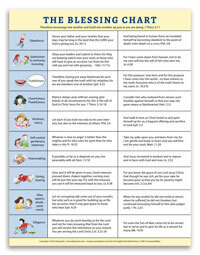 What a helpful resource for Biblical parenting! We have both the print and ebook version and I love them both! The ebook could easily be purchased alone to use as a main text. I use the ebook version a lot when I just need to refresh my memory on how to handle a particular issue, or look up a quick Bible story or parenting tip. I take out my phone or iPad and am able to get the information I need easily! I love that the links in the ebook help me get around quickly as I can jump to related topics. The scriptures are linked out to an online Bible resource as well. The ebook itself has been a really great addition to our parenting tools. We have worn out our first copy (cover missing and pages getting beginning to fall out) so we are purchasing our 2nd copy in 3 ring binder format. I praise God that His word is sufficient and for this tool that gives direction to the answers found there. This is my favorite item to give to parents. When you have your first child, you are told they don't come with instructions….well, I would strongly disagree! I discovered this gem of a topical bible+ when my now 18year old was only four. We have used this to help us disciple our children for the last 14 years and we are still using it (although I must say I should probably replace it as the cover and first few pages are gone!). We used it to bring discipleship to our children and raise them in the ways of the Lord. To instill in them the understanding that God was the highest level of authority and to not ever give them the old-age answer of "Because I said so." When God was placed as the ultimate authority in our home our children were so much more willing to submit their wills to His ways then just because we had made up a rule to make their lives miserable. This is the number one book I have referred to most often to many mothers with children of all ages. I have had this book for years and find it so helpful. To be honest, i havent used it that much. But it isnt because it is not good, i am a bit lazy...But the thing is, it should be the "lazy" parents best friend..Mrs forrester has put sooo much time iknto this resource ; it is such a thorough , although not exhaustive study on different sins...each sin is exposed through bible verses, what the bible says about the person who comits that sin, what the punishment might be, bible stories that exemplify the sin and the good character to counter the sin. It is amazing...i have been through some tough growing times lately and plan to use this resource more diligently with my children as a homeschool bible class and daily quick go to guide for instructing them in righteousness. Thank you so much for putting so much time and thought into this study. This is an amazingly thorough resource that I refer to often for inspiration in guiding my kids (and myself). I appreciate the practical ideas for helping communicate biblical truth. It is a definite go to reference when my mind is muddled with the situation and I can't seem to recall any verses that will help. This book takes me back to applicable scriptures every time. 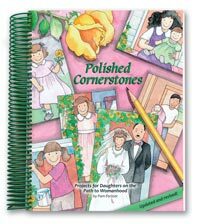 We have used many Doorposts products through the years (the Ruby Doll, Plants Grown Up, Polished Cornerstones, along with the blog and other helpful Forster Family resources) and have been blessed by their assistance and encouragement to our family. We have especially benefited from having a copy of For Instruction in Righteousness as a valuable resource in training our children (and often our own hearts as well!) It's a great gift for first-time parents. I received my book SPEEDY FAST! It was in PERFECT CONDITION. The book is packed full of wisdom and a great guide to raising our children for Jesus! I am even going to use it as a study for the children. We have trouble with arguing in our home between the girls more often than I would like. So we're going to be doing our first study by going through that section and looking things up in our Bible. I have just a one subject notebook for each child that we're going to be using as we go along. This book is an answer to prayers. Thank you, Doorposts, for offering this amazing book and for the way that you handled everything so quickly and perfectly! Blessings!!!! When I came across this book I was struck by the practical examples of how to apply Scripture in a child's life. It taught me how to discipline children like God does - not always with the rod. It gave me a path forward and hope for the future. Immediately I was able to identify pride in my child's life. This, in turn, led to a freedom from guilt in my own life. I was feeling guilty because I didn't always treat her like a princess. She would ask for a certain colored bowl and I would often give it to her - but inwardly I felt like something was wrong. I wondered, why do I feel reluctant to give her the orange bowl? I recognized that the proper response to her pride was to be humbled - not exalted. As we talked together I explained the usual consequences of pride, being humbled or "abased". This is the pattern that God set up. I was then able to set up this pattern in my home to teach her that humility is the better attitude that pleases God. For Instruction in Righteousness Is A Gem! We are currently parents of children from ages five to seventeen, and we have over the years fostered several other children who now range from five to twenty-two years. We have owned and used this reference book for over twelve years. It is a fabulous resource! Time and again we have brought this book out, searched it and prayed through the text, and moved forward in instruction and/or discipline with our children. More than anything, we appreciate its guided format and the opportunity it gives us to pause in our response to our children's childish or foolish choices. It is truly a text that encourages us to love God and to love our children! How perfect to find an example of building up and not tearing down--a tendency my Son has with words to his family--using Legos! That is right along his interest and will cement what we have been trying to reinforce for a few years now. How we desire to instruct in the right ways God has written for us--and this book is one that can practically give life lessons. The unexpected bonus is that we, the parents, are learning right along side! This book is jam packed with Scripture so it is easy to find the one most relevant and on the level of your child. I like that it allows me to walk away from the situation feeling good. I didn't just raise my voice and go into a lecture that sounds like a bunch of white noise to my child. Instead, I am able to take the time to sit down with her (letting me cool off too) and read through the scripture together. Yes, she is still disciplined for her behavior, but there is now order to the discipline. SO Helpful With Little Kids! I got this to help me look up scriptures for the moment by moment issues that I deal with alot with having 3 little ones (ages 6, 3, and 1)! I just don't have the time to sit and look up in a Strong's concordance everytime I need a scripture to help and give instructions to my kiddos! This is a GREAT resource for the small and big issues in life! I want my kids to grow up learning scripture as their lifebase and how they can deal with situations or feelings and what is wrong and why! I love this book and would recommend it to anyone who wants to raise their children with scriptures! 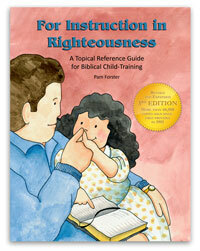 For Instruction in Righteousness has been such a helpful book to our family. I used it as a kindergarten teacher at a Christian school for 7 years. I became a homemaker when we had our first of three children. It has been an incredible resource to help us teach and train our children in the ways of God. It makes finding the right verse/passage for any given issue so easy. Thanks so much for helping us train our little ones in righteousness! A friend of mine recommended this! She said that besides the Bible, this was one of the best "parenting" books to have! 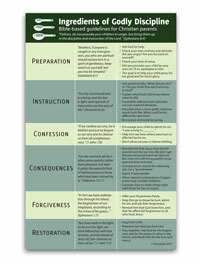 I have found it to help me in my own struggle of sin as well as easily label the sins of my kids. I wasn't raised to recognize my sin so this book helps really me narrow down what the sin is that my child is struggling with so we can work on putting on the RIGHT behavior instead! A true blessing to our family! We are parents of 9 children with our 4th grandchild due in February. We are purchasing these manuals for two of our married children to use with our grandchildren because we have used this reference as a tool in our child rearing for many years now. When our oldest children were very little, I remember starting a notebook of Bible verses to use as a handy guide for ourselves and did a whole lot of homework putting it together and adding to it as I had the time. One day, at a homeschool convention, I found this, and my notebook was nowhere as wonderful as this was!!! And it has been a God-send ever since! Thank you for this wonderful reference and tool. We are hoping that our children find it as helpful with our grandchildren as we have!! Really wish I would have had this handy many years ago. Raising children in a christian home with a biblical view on everything isnt easy and we can all use a helping hand to remind us where to look for answers...the bible! Find biblical solutions very quickly. When your "in the moment", just pull out this handy book. Other Doorpost materials have been a blessing too! Thank you for sharing and giving families tools to keep us focused on what is truly important. Have used this with all of my children and recommend it to friends. I refer to it often for child training and also for copywork. Love that it is spiral-bound to lay flat. In short, this is an excellent tool to have in the home. It has helped me quickly reference a problem so it can be dealt with. I highly recommend becoming thoroughly acquainted with the book so when it is time to use it, you aren’t fumbling with how to use it. Not only is it good for helping on-the-spot behavioral and heart issues, but it is also an excellent preventative study. Excellent Biblical Resource For All! 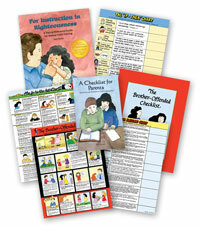 This is one of my top favorite resources that I like to give to homeschooling moms. I have had my well-loved copy for 9 years and has been a go-to for when I needed to handle offenses as well as personal character issues. I also have done much heart-searching study on my own character trait by character trait, verse by verse. I love it! I purchased this resource several years ago when my daughter was six, and I'm still using it diligently (esp. now my second daughter is four). Every issue where sin arises, this book breaks down the sin and its consequences. In some instances, there are great examples that physically show children what damages are caused by sin and being separated from God. Although adults can comprehend hell and eternity, children have difficulty grasping time and how much pain it would really be. This is a must have for any parent desiring to raise their children biblically. I homeschooled my children when they were very young and we were blessed to have been introduced to your wonderful products. When I began working at private Christian schools in our area, the "For Instruction in Righteousness" book came with me. This book has been used for 10 years to help bring children to God's Word and His ways. Many children that needed guidance due to discipline issues, have been touched by the teachings of this wonderful book. I strongly recommend the "If Then Chart" (worked wonders in our home when my children were younger) and the "Blessing Chart" was a must as well. I love this parenting tool. The only problem with it is that I don't use it often enough! I tend to go to it only when we seem to have a severe problem with something. It's a very handy quick reference to find a plethora of appropriate Bible passages. It includes not only verses dealing with the negative character trait and it's consequences, but also gives verses for the opposite Godly trait and it's corresponding blessings. Definitely recommend. I also have appreciated finding some good alternate "punishments". My husband and I love that all of your products are based entirely on God's word! This is great Biblical council for parenting. We all know the instructions are in the Word, but sometimes its tough to get your hands on that one scripture when you can't remember the reference. You can teach, meditate, and discipline with this AWESOME topical compilation. Beautiful, just beautiful! Highly recommend it! What a great idea! I feel like the I'm being mentored in parenting by a wise, loving Titus 2 woman when I use this.